The club has been informed of the death of former Junior School teacher Jennifer Higham. 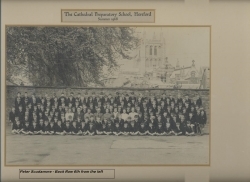 Jennifer was at the Junior School for more than forty years and still had a strong connection with the school today. From Andrew Higham - Mrs Jennifer Higham, worked at Hereford Cathedral Junior School from 1959-1999. She originally acted as Headmaster’s Assistant and following teacher training in 1964 she was appointed Year 1 class teacher. After her retirement she continued to support the school with occasional appearances in the office. The retired class teacher died from Parkinson's disease after a four year fight, in Hereford Hospital on 8 September 2015, aged 74. ‘Some outstanding teachers are honoured with knighthoods or have assembly halls named after them. Most just live on in their pupils' memories. But surely only one can see a racehorse flash past, bearing her name and the colours of her school. Jennifer Higham worked at Hereford Cathedral junior school for more than 40 years, starting as an assistant then returning after teacher training. One devoted pupil when she was a student teacher in the 60s was Peter Scudamore, one of the greatest jockeys of all time. Mrs Higham led an active retirement involving volunteering for Hereford Riding for the Disabled(RDA), organising Royal British Legion Poppy Appeal collections, walking Offa’s Dyke with friends, Canadian Canoeing with Hereford Canoe Club, Long-distance Horse rides and foreign holidays to Australia, New Zealand, South Africa and Canada. Being wife, mother and grandmother were the most important part of her life, she valued them more than anything. She was always interested in and concerned about others. Her funeral at Hereford Cathedral on 25 September was attended by mourners including ex-pupils, parents and colleagues from HCJS with family and many friends. Muffled Bells were rung by the band of bell ringers she rang with from her local church in Woolhope.